Meet the Crew - Go Navy Go! Before I learned of the Leaders to Sea program, I would have thought that the hardware (planes and things that go boom) would have interested me most. Once I heard I might get to go, I found I was most interested in the organization. I was interested to see how the Navy could manage up to 6,000 people with an average age of 19 years old, while consistently accomplishing a mission that is much more difficult and dangerous than I will ever face at the office. Another pleasant surprise was seeing the diversity among officers and enlisted crew. I learned that 10 percent of the pilots are women as is 20 percent of the crew. 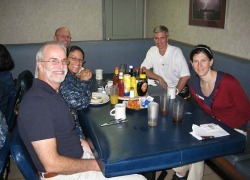 For example, I enjoyed lunch onboard with a Chief Petty Officer in the medical department on my left. She’s married and has a teenager at home. Her husband’s taking care of him while she is on deployment. HST’s crews work minimum 12-hour shifts, often longer during flight operations. The Safety Officer told us that during their last deployment to the Persian Gulf, flight deck temperatures daily reached 135 degrees, and the longest workdays went 20 hours. How the sailors withstood it, I have no idea. And yet, every crew member seemed clearly happy. 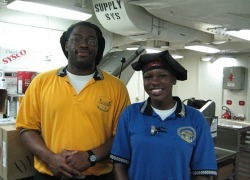 Everyone we met — even by chance in the passageways — was articulate, courteous, mature and proud to be on this ship. The Navy had somehow taken 6,000 kids from all walks of life and converted them into a professional team that any corporate enterprise would be thrilled to hire en masse. How on earth did they do that? I’m still wondering. 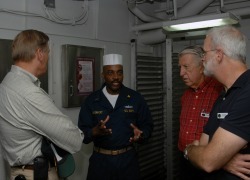 To illustrate, it was inspiring to listen to Chief Petty Officer Davenport in charge of preparing 18,150 meals daily across nine dining areas. With 25 years in the Navy, CPO Davenport loved mentoring his staff to prepare food that was not just adequate, but delicious (all the food we had onboard was indeed excellent). “I thought about retiring when I reached twenty years, and my wife wanted me to,” he said. “She wanted to have me at home; I wanted to be there, too. But she knows I love the Navy, I love what I do. She understood when I decided to re-up for my full thirty years”. Until now, I’ve been generally grateful for the sacrifices made by our military forces in safeguarding our rights and liberties. But I have to admit, before attending Leaders to Sea, had my son grown up and expressed an interest in enlisting, I probably would have told him that a Navy career might be a good idea for others, but not so for him, because he could make more money in another job, because of the long deployments on the seas, and, OK, I’ll say it, because of the risk of death or injury that accompanies any military commitment. Now I would encourage him. The reason might surprise you: It’s because the people I met were happy. They were key players on a winning team, and they all seemed to know it. They are bright, articulate, confident, proud and professional. This is the best experience that any young person (or his or her parents) could hope for.